We’re a little late to the party, but we can’t pass up an opportunity to commemorate the 40th anniversary of Tyscot Records, the nation’s oldest African American owned and operated gospel music label. Founded in 1976 by Dr. Leonard Scott and L. Craig Tyson in Indianapolis, Indiana, the label has grown into a multi-media company that produces films as well as recordings. Yet Tyscot remains a family run operation, guided by Dr. Scott as CEO, with son Bryant S. Scott continuing the legacy as President/COO. Now entering its fifth decade, the label is an industry powerhouse whose artists garnered 19 Stellar Gospel Awards nominations in 2017. Tyscot was originally established to record the Christ Church Apostolic Radio Choir, led by Bishop James Tyson (Craig’s father). 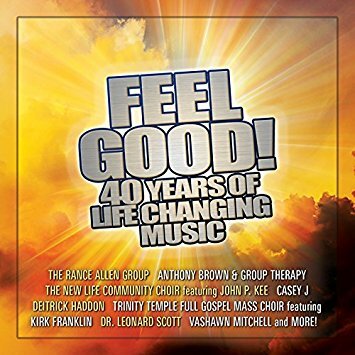 The choir’s first hit single, “Feel Good!,” is the opening track of this anniversary compilation in a contemporary version re-recorded by Dr. Scott. The remaining 14 tracks feature songs by artists whose careers were launched by Tyscot, starting with “Hold On” (1981) by The Pentecostal Ambassadors, a popular male vocal trio from Indianapolis. Following is the smooth, ballad style “Say You Believe” (1986) performed by Deliverance and co-written by none other than Indianapolis native Kenneth “Babyface” Edmonds, who at the time was a member of the R&B group The Deele. Other early Tyscot releases featured on this set include the classic “Jesus Is Real” by John P. Kee & the New Life Community Choir, “Holy One” featuring Kirk Franklin with the Trinity Temple Full Gospel Mass Choir, and the P.A.W. National Mass Choir’s “How Majestic,” a fantastic arrangement based on Handel’s “Hallelujah Chorus.” Sequenced in chronological order, the set concludes with contemporary gospel artists, including break-out stars Anthony Brown & group therAPy (“Do It Again”) and Casey J (“Better”) who have been topping the charts this year. Feel Good! 40 Years of Life Changing Music showcases the talents of local and national gospel artists and cements the legacy of Tyscot Records. The company is stronger than ever, and positioned to remain an industry powerhouse in its fifth decade. This entry was posted in Doo-wop and Vocal Quartets, Jazz, Popular, Rock, and Misc., Rhythm & Blues, Soul, Funk and tagged 2017, 2017 Album review, 2017 albums, 2017 releases, Babyface, Brenda Nelson-Strauss, Feel Good! 40 Years of Life Changing Music, John P Kee, Kirk Franklin, New Life Community Choir, Tyscot Records by aaamc. Bookmark the permalink.